When is a children’s show not really for children? When it’s directed by Rupert Goold. As the artistic director of Headlong, Goold achieved critical acclaim for all of his directorial endeavours over the past few years, ranging from a Stalin-esque Macbeth with Patrick Stewart, to Enron, where he used dance and physical theatre as one of the devices to tell the story of the Enron corporation, to a stylistic vision of the how we’re destroying our own world in Earthquakes In London. Enron and Earthquakes In London in particular were two of the best theatrical experiences I have ever had, so it was with a nervous anticipation that I went to see Goold’s vision of Narnia on which he collaborates with Threesixty, who did last year’s critically acclaimed version of Peter Pan at the same venue. I remained nervous until the four children made their entrance at the beginning of the 1st act in stark white light and smoke, wearing gas masks. I relaxed. I wasn’t about to be subjected to Disney and stuffed animals after all. C.S. Lewis’ Chronicles of Narnia are quite dark at their heart – a world full of religious imagery, of the very good and the very bad, and all that lies betwixt. Most attempts to adapt the Narnia books (aside from the now extremely dated but fondly remembered BBC adaptations in the late 1980s) have fallen quite flat, as Lewis’ “books for children” really aren’t for children at all. They are part of a whole period of children’s literature that was filled with dark morality tales, where books taught children more about life than school did. Over the years there have been cartoons, musicals and even a series of blockbuster Disney films all trying to capture the magic contained in the pages of the Narnia chronicles, often focusing on the second and best known book, The Lion, The Witch And The Wardrobe. I have a very strong connection with the Chronicles Of Narnia, having read them as a child (and several times since) and because I watched the BBC adaptation several hundred times on video. So seeing a stage production would always be daunting with this much to live up to. I usually find, with most things like this, that the stories are sugar coated – tailored for children with all the darkness removed. Luckily, Rupert Goold has a dark heart, and that is woven through every part of this adaptation. For the uninitiated, The Lion, The Witch And The Wardrobe follows the story of four children, Peter, Susan, Lucy and Edmund, who are evacuated from London during the second World War to live in a big house in the country with the strange and unusual Professor Kirke. Whilst playing hide and seek one day, Lucy (the youngest of the siblings) hides in a large antique wardrobe in an abandoned room, and behind some old fur coats finds a porthole to another world, the land of Narnia. Narnia is filled with a variety of strange and wonderful creatures, fauns, talking animals, who live in fear under the rule of the White Queen, pretender to the throne. This heavily stylised production, which contains more than a small nod to the beautifully staged musical production of Lord Of The Rings, involves wolves on ornate crutches with fetish-inspired masks, a Centaur on stilts, and people in jagged wooden masks suspended from the ceiling as trees. There is no set apart from a large wooden wardrobe that appears and disappears from inside the stage. There are songs, but they seem more like haunting chants, traditional Narnian music handed down through generations. The choreography, courtesy of Georgina Lamb, is beautifully danced and in just the right amounts – this does not feel like a dance show, but the physical elements, as with most of Goold’s work, enhance the style of the piece perfectly. The 360 degree projections by artist Chris Randall are hauntingly beautiful – giving us everything from snowfall to the wardrobe breaking down, to the White Queen’s dark magic ritual – and they give you a sense of place, which is somewhat lacking from the bare stage. Entrances and exits are done through the auditorium, giving the audience a feeling of involvement you wouldn’t get from a proscenium arch venue. The performances are flawless – all four children are excellently cast (even if Johnny Weldon’s “Edmund” feels at times that he would be more at home in the rock musical Spring Awakening) and special mention must be given to Carly Bawden as Susan. This is the third production I have seen Carly in, (Kneehigh’s excellent Umbrella’s Of Cherbourg last year, and also the bizarre reworking of Pippin at the Menier Chocolate Factory where she had to dance “en pointe”) and she has been fantastically diverse in all three. I’m looking forward to seeing where she goes next. The incredible Sally Dexter is deliciously menacing as the White Witch, in a performance that is as far away from Children’s Panto Villain as it could possibly be. Sophie Louise Dann’s Beaver (how long have I waited to be able to say that?) is loveably funny whilst still having the gravitas needed for the more serious scenes she is involved in. 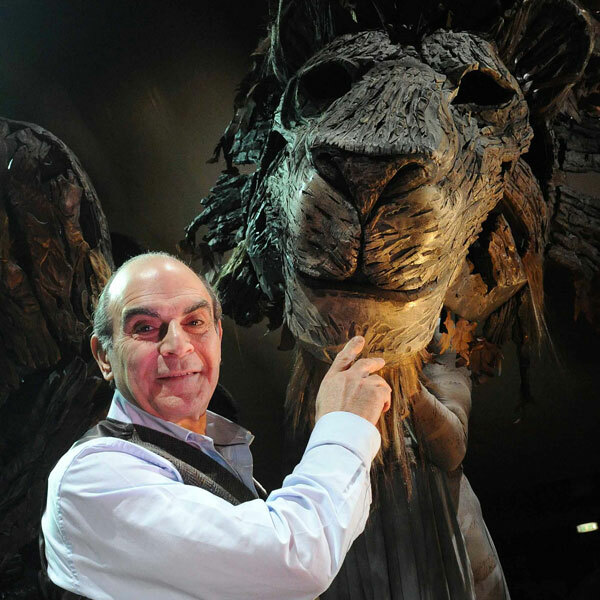 If you have any interest in the Chronicles Of Narnia, or just a love of truly creative theatre, see The Lion, The Witch And The Wardrobe at all costs. I was spellbound from the moment I sat down in the Threesixty Theatre, so much so that even the wardrobe breaking down and the show having to be restarted didn’t mar my enjoyment. My only recommendation for Threesixty’s latest production? Don’t take kids under 10 years old. The chances are the songs and the darker elements might go over their heads and, judging by the children in front and around me, some of the more serious moments will leave them restless. That’s not to say it doesn’t do its job, it is a fantastic adaptation of a beloved children’s classic, but it’s a dark classic and this is a suitably dark and serious production. It’s a master class in creativity, with a beautifully artistic vision, but younger children may lose their way with it.